Following on from yesterday’s blog about the anti Hs2 campaigns false claims of ‘falling’ passenger numbers & no business case for Hs2 I’ve been crunching a few numbers. When Virgin Trains started running trains on the West Coast Main Line (WCML) in 1997 there were 13.6 million passenger journeys. In 2014 that had increased to 34.5million – an increase of 153.6% or an average of 5.6% per year. The Hs2 business case is based on an annual growth of just 2% per year up to 2039..
We are already far, far ahead of Hs2’s conservative projections – and that’s just because of one TOC on the WCML. One of the most laughable aspects of the anti Hs2 campaign is the way antis try & pretend there’s no capacity argument for building Hs2. They do this by focusing exclusively on peak time Virgin trains services out of Euston & ignore everything else such as inter regional & local services, freight, or capacity constraints at other major stations on the routes Hs2 will relieve. These ‘look over there’ tactics fool a few observers but anyone with any knowledge or experience of the railways isn’t fooled. What’s also significant is the even larger rise in long distance passenger kilometres (The number of kilometres travelled by passengers on the network). Of course these are only the long distance figures. There’s sustained growth across all the other sectors too. Hs2 antis deliberately ignore them but it’s obvious they have an impact on mainline capacity as they use all the main stations that long distance services like Virgin West Coast do! Another nail in their coffin is an interview with Virgin Trains West Coast Executive Director (Ops), Phil Bearpark which has been published in the Railway Gazette. Of course, this is just the WCML. Hs2 also releases capacity on the East Coast and Midland main lines, which are also experiencing a growth in traffic & capacity constraints. With the economy picking up & the UK population projected to hit 70 million by 2027 (the year after Hs2 phase 1 opens ) & 73.2 million by 2035 (two years after phase 2) there’s no reason at all to believe Bearpark’s projections are optimistic . Well, not unless you’re an Hs2 anti in denial of course! Continuity is also the name of the game over at the Department of Transport where Patrick McLaughlin remains in post as Transport Minister. This is good news for the rail industry and Hs2 as there’s no need to get a new Minister up to speed with what needs to be done. Of course, all this is bad news for the anti Hs2 camp who don’t seem know which way to turn now their ‘great white hope’ (UKIP) has vanished in a cloud of voting papers – taking a huge chunk of the anti Hs2 tweeters with them. The anti Hs2 mobs Twitter campaign has descended into farce since the election. There are still a few blowhards hanging on from the old days who think ranting on the internet changes anything but many of them are isolated individuals with no backing, or what can be charitably called ‘special people’. Here’s a typical example of the isolated Tweeter from that well known hotbed of anti hs2 activism. Err, Lisburn, in Northern Ireland (‘hotbed’? Are you sure this is right? Ed). The folks who are noticeable by their absence nowadays are the supposed ‘action group’ network although this is hardly surprising. They’ve been in decline for years & really have nowhere to go anymore. The Hybrid Bill petitioning process has drawn any sting they might have thought they had – and the election results have shown they’ve no political clout (even at a local council level). Their public rallies have been abandoned as an embarrassment as so few folks turn up. So there’s little reason for their existence any more. I do genuinely feel sorry for the people who are affected by Hs2 & who’ve been gulled into thinking the anti campaign really could stop Hs2. They’ve been given false hope & some of them have thrown away both time & money. The election results have shown that the scales have dropped from quite a few eyes. Sadly it’s too much to hope that the people who cynically exploit them (StopHs2 & Hs2aa) will suffer an outbreak of honesty, realism or contrition. However, the good news is that as their activist base dies a source of funding dries up too. As StopHs2 funds come predominantly from one man – it’s anyone’s guess when he’ll see sense & stops throwing his money away. As another example of a campaign going nowhere fast I’ve updated the antis ‘scores on the doors’. These show their social media growth (or not!) on Facebook & Twitter. Looking through social media the anti’s sense of aggrieved bewilderment is obvious. Some of them had bought into their own hype so completely they still can’t admit what had really happened at the election. There’s complete denial over the implications of their general election no-show & risible ‘no votes for you with Hs2’campaign (which influenced no-one at all). What none of them will talk about or deal with is the awkward question of ‘how are we going to Stop Hs2 now’? Because the answer is staring them in the face. They can’t. At the risk of falling in the trap of Godwin’s law – I can only compare them to the last days of the Third Reich & the mentality inside the bunker as the Russians closed in, with UKIP in the role of General Felix Steiner’s Army Detachment. No doubt there’ll still be media speculation & a fair bit of froth in the next few months as the Hs2 Hybrid Bill continues its course through Parliament but the position is clear. There’s no credible opposition to Hs2 & there’s even less of a credible alternative. 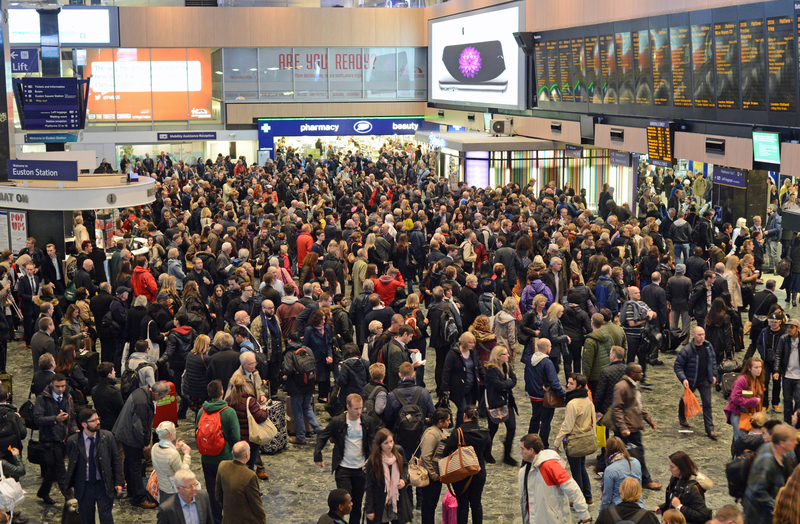 Rail passenger growths continues apace as the economy picks up – and look out for some interesting statistics & comments to appear from Virgin Trains on their West Coast business. Earlier this week I spent a couple of days at the Railtex trade trade fair at the NEC in Birmingham. In truth, I could have done with being there for all three days as the show had a record number of exhibitors and an awful lot to see & do – and people to talk to. The event was opened by Network Rail Chairman Professor Richard Parry-Jones who delivered a keynote speech in which he talked about way technology is transforming lives (and railways), the cost of providing extra capacity & his worry that the industry is under-providing capacity for future demand. 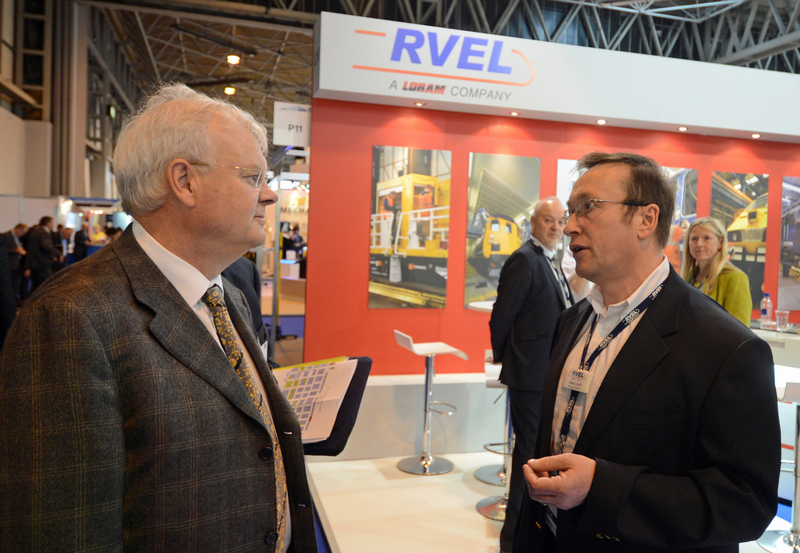 Afterwards he went ‘walk-about’ to visit some of the exhibitors such as Siemens, Hitachi and Derby based Rail Vehicle Engineering Ltd (RVEL). Meanwhile, the show was getting into full swing. The Chinese had a big presence this year with both CSR and CNR having large stands that must have kept Chinese model makers busy for months as both displayed huge numbers of product models – including CNRs high speed trains. 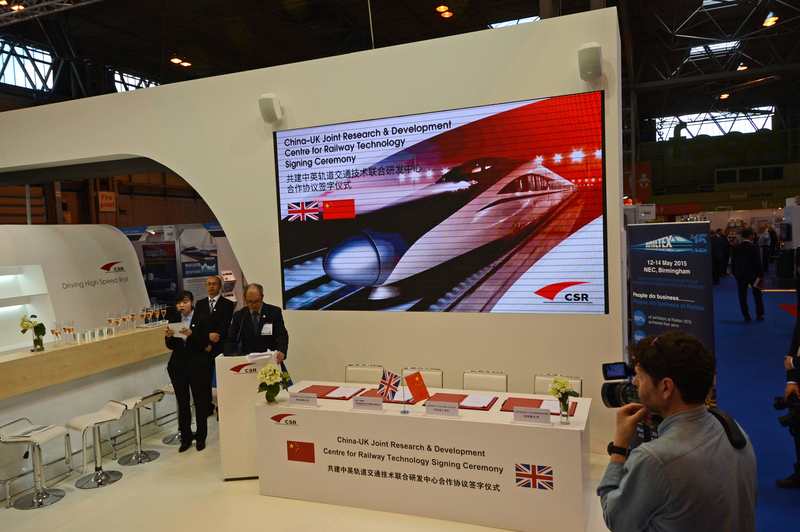 On the CSR stand a signing ceremony was held to seal co-operation between the company & the universities of Birmingham, Southampton & Central London by forming the China-UK joint research & development centre for rail technology. In a statement, CSR said the centre would look at developing new technologies, new materials and new production processes. Although they had separate stands, the two companies are merging to create the world’s largest railway equipment manufacturer. The merger should be complete by the end of the year. 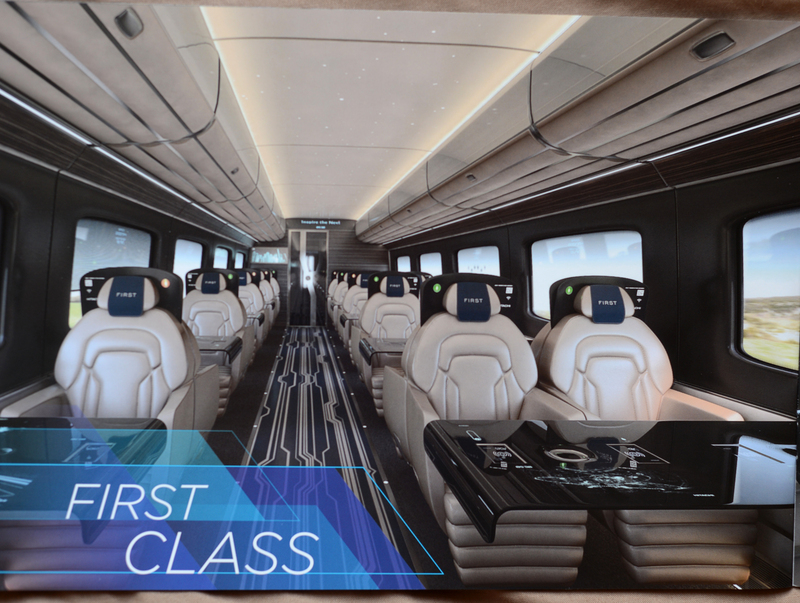 Elsewhere, Hitachi were demonstrating their 3-D interior images and design theory of their ‘British Bullet train’ – a potential offering for Hs2. 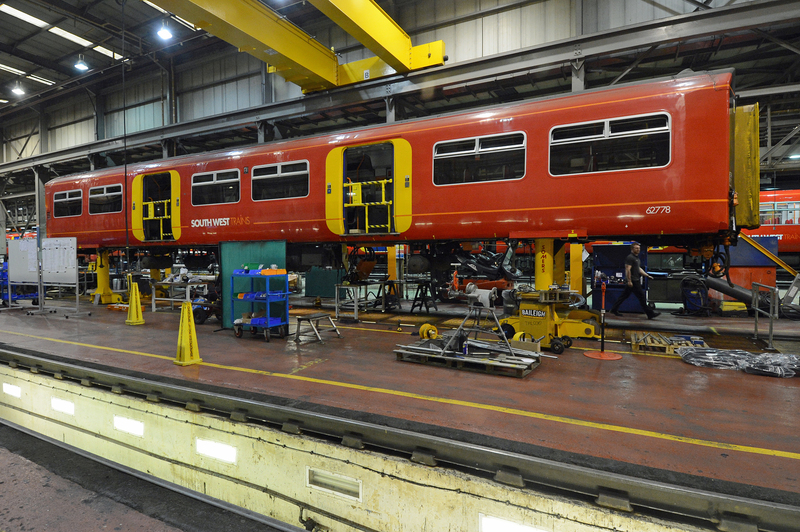 The design draws upon key influences from existing and influential rolling stock in the UK. 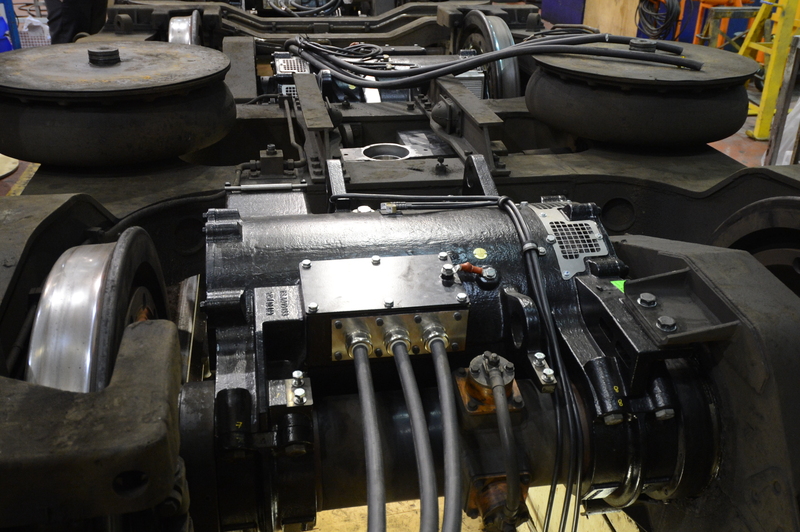 Using these to look forward & address the needs of future passengers by providing a train that has the flexibility to grow and evolve with their needs. 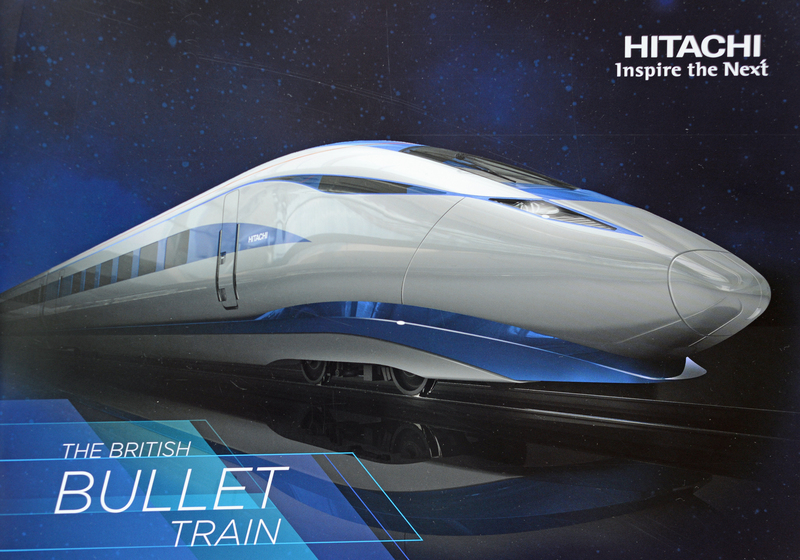 Take a look..
Sleek & stylish, the British bullet train from Hitachi. 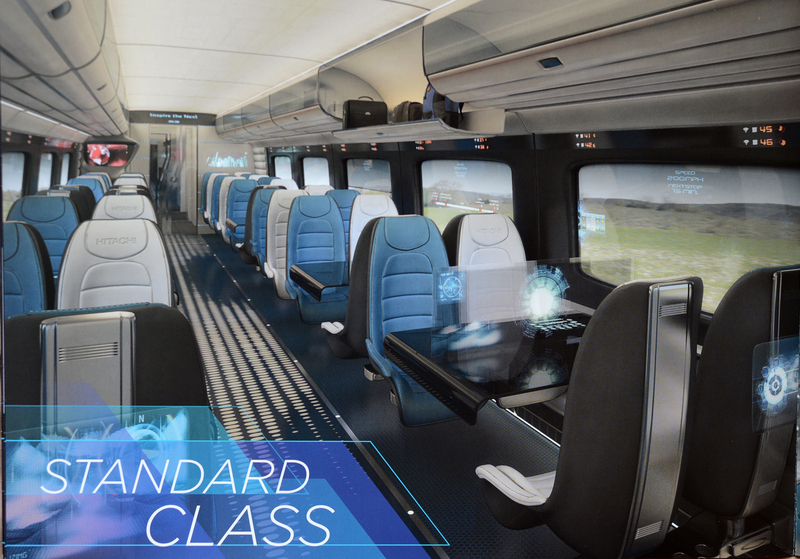 Could this be the 1st Class of the future? The Europeans had been busy too. Siemens had a large stand showcasing their impressive array of products, including Trains, signalling systems & power supplies. 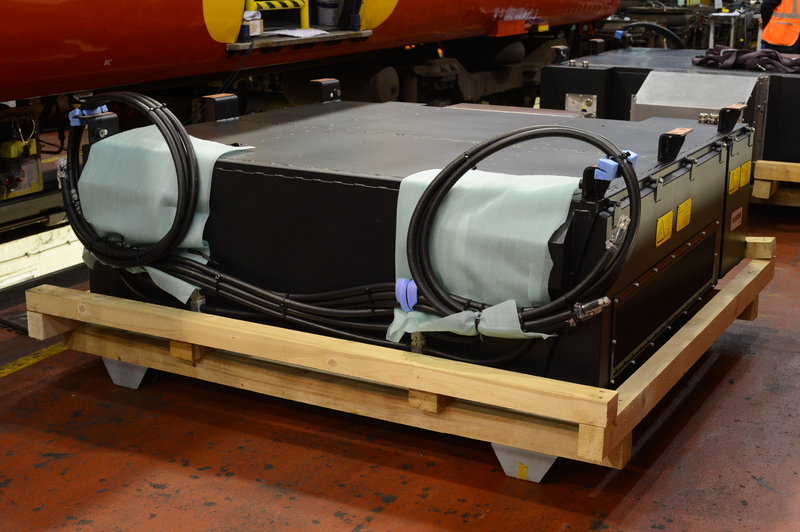 In a low key launch the company had slipped out a model of a new 125mph EMU for the UK market – the Desiro Verve. Siemens told me they’ll be doing an expanded launch for this train later in the year. 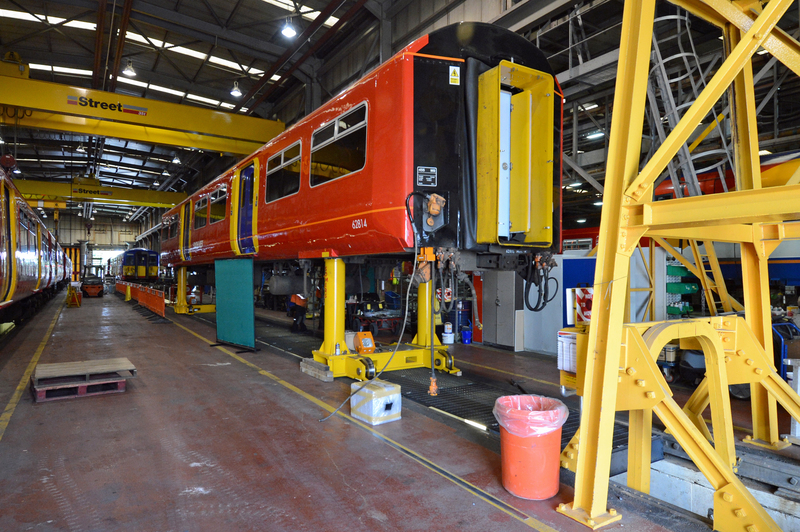 Of course Railtex wasn’t all about new trains. One of the strengths of the event is variety of exhibitors from the massive multinationals through to the small UK companies who supply equipment & expertise worldwide. 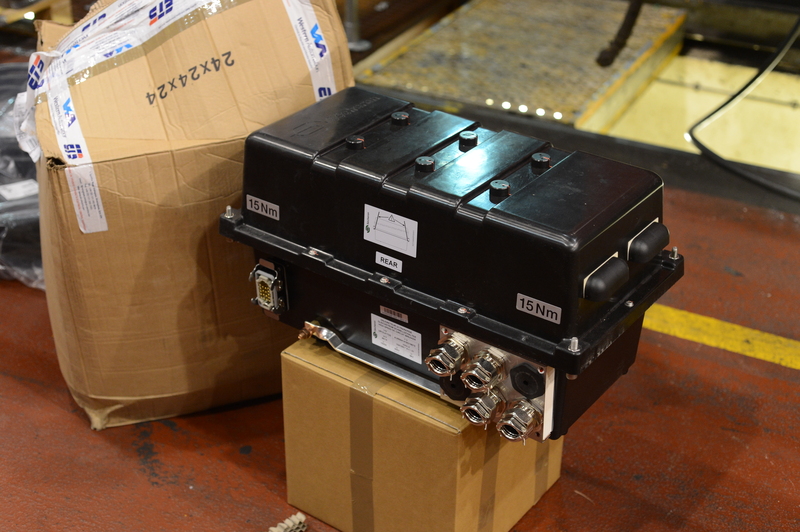 Railtex is the ideal opportunity to check-out what they have to offer. It’s also a fantastic place to touch base with companies you already work with -and meet potential new ones. I ended up working for several at the event itself as well as arranging new business. At the end of day 1 the networking event allowed many of us to meet in an relaxed atmosphere over a drink & some snacks before heading off to more events – or take the weight off tired feet! Day 2 began with another keynote address, this time by Alstom UK President Terence Watson (wearing his Rail Supply Group Co-Chair’s hat). 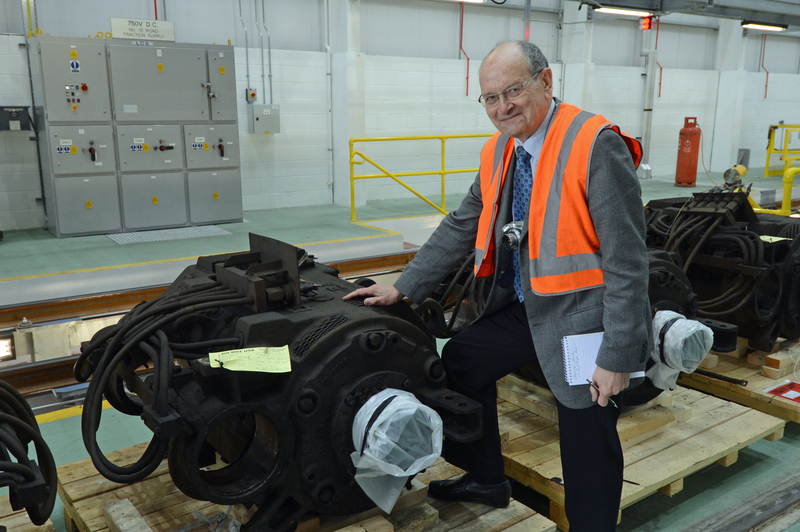 Terence spoke about the value of the rail supply chain, how big the world wide market is – and how small UK exports are at the moment compared to the likes of China & Germany. From my personal perspective Railtex was a great success. Many others I talked to thought so too. I’ll certainly be back next time. One theme I was left with was the continued development of rail technology & the growth of high speed rail. What was on offer at Railtex shows just how uninformed & stupid Jeremy Paxman’s Financial Times rant about HS2 & HSR being ’19th century’ really is! Anti Hs2 mob, Hs2, Hs2aa, Railtex. Railways. Politics. I’ve finally got a few minutes spare to blog an update from this special train from St Pancras to the Barrow Hill Rail ale festival, where I’ve been taking PR pictures on board. To say it’s been another busy week would be somewhat of an understatement. I’ve spent the past few days at the excellent Railtex trade fair at Birmingham,(I’ll be blogging about that over the weekend). Two days really wasn’t enough – I could have done to stay for all three as it was a hectic whirl of networking, photo opportunities and making new contacts. A paltry 1221 members shows just how irrelevant their campaign’s become. To make matters worse they forgot to include a rather important hashtag so its internet impact was zero! How much longer their campaign can survive is a very good question as they’ve nowhere left to turn. After a week at home I’m back on the rails & heading for Birmingham. I’ll be based there for the next couple of days as this years Railtex exhibition is at the NEC. It starts tomorrow & should be a fascinating event. From what I’ve seen so far it promises to be the largest ever. 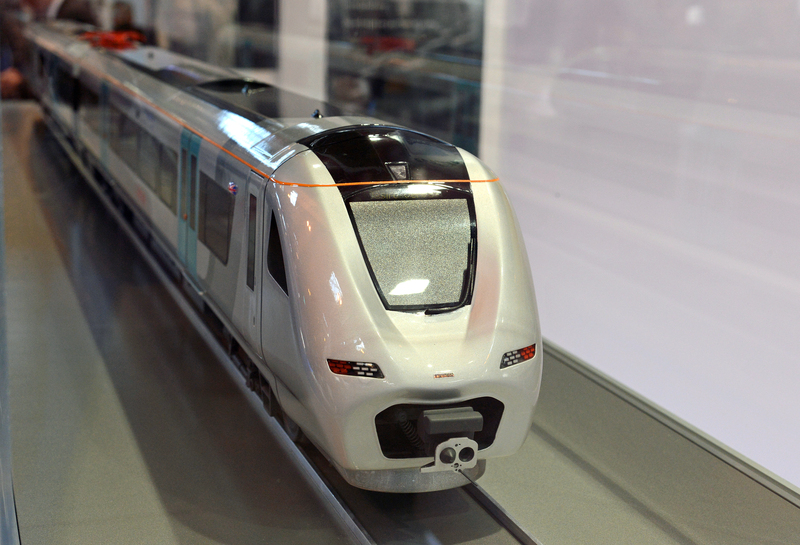 There’s a whole host of presentations on matters such as rail electrification & Hs2, plus train builder Hitachi has something to say on their vision for high speed rail. Railtex is always a good event to catch up with friends, colleagues & keep abreast of developments in a diverse & growing industry. In the meantime, we await the announcement of the new Tory transport team & who will be appointed Transport Minister. Whoever it is will have a busy time! There are some huge schemes & big ticket items for the department to look after. Expect some blogging & lots of pictures to appear over the next few days. 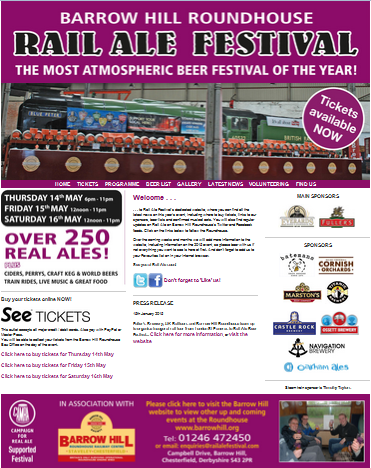 After B’ham I’m back in London for another event that combines two loves – beer and trains! 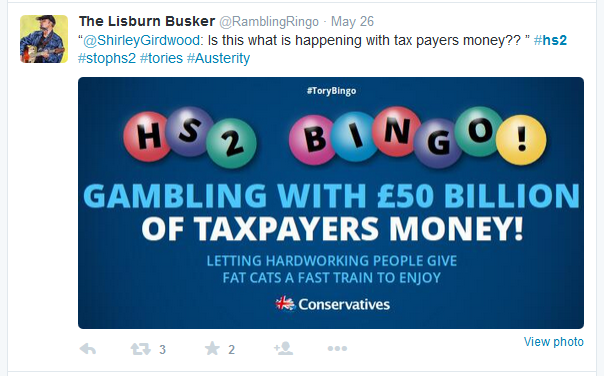 Election 2015 – an absolute disaster for the anti Hs2 campaign. I’ll ignore my personal disappointment at the overall result to focus on the implications for HS2 and a look at how badly the night went for the anti Hs2 campaign. OK, let’s not beat about the bush here it didn’t go ‘badly’ – it was an outright disaster. Throughout the election campaign I’ve been blogging about how the anti campaign’s been writing cheques it can’t cash. Their laughable ‘no votes for you with Hs2’ being the classic example of hype & hyperbole. Now the results are in and so we can cut through the spin & look at the reality. First off has to be the supposed anti Hs2 ‘strongholds’ which are the Chilterns & Warwickshire. The results in both are very, very telling. Antis claimed Hs2 was the pivotal event that would decide the election in North Warwickshire (formerly held by Dan Byles MP, who was standing down). The result? As the article states, Lidlington’s vote was down a mere 1.5% which, when you consider the outrageous claims of the anti Hs2 campaigners is a pretty damning indictment of their supposed influence. Mind you, If I was UKIP I’d be very pissed off with the anti hs2 mob. They promised the party thousands of votes & failed to deliver every time. It’s clear UKIP were fooled into banking their votes, assuming this meant they were a shoo-in at constituencies Hs2 passed through. It’s not just the general election either. There were council elections too. 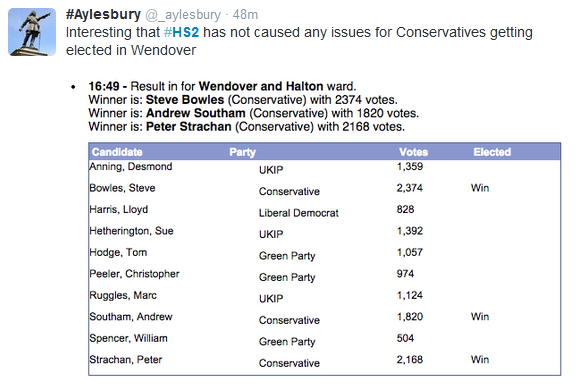 Here’s the results in another supposed stronghold of the anti Hs2 campaign – Wendover in Bucks, where all 3 seats were won by the Tories. In fact, there’s nowhere the anti Hs2 campaign manifested itself in the popular vote. They failed to wield any influence in their supposed ‘strongholds’ or anywhere else on the route. As for away from the route – forget it! I’ve long said that their campaign’s a chimera, oft talked about but never seen. Sections of the media have given them an easy ride & never scrutinised their claims. That needs to change & I hope this blog will encourage fellow journalists to do that. Back in the real world it’s clear that Hs2 will continue just as soon as Parliament reconvenes. The election result couldn’t have been worse for the anti Hs2 campaign. The Tories return without coalition partners, UKIP have been emasculated and the one Labour front bencher who was seen as wavering on Hs2 (Ed Balls) has lost his seat. Talk about being in denial? The PM’s just been re-elected for another 5 years with the Hs2 antis having shown they’ve absolutely no electoral clout – even in the Chilterns. More delusions that aren’t even worth commenting on..
Oh, there’s one result that speaks volumes. The only constituency that had someone standing purely on an anti Hs2 ticket was Westminster North. Here’s the result. I predict it won’t be long before Warks millionaire Joe Elliott (the man who’s bankrolled StopH2) finally puts his chequebook away & that group folds. Will Hs2aa be far behind? 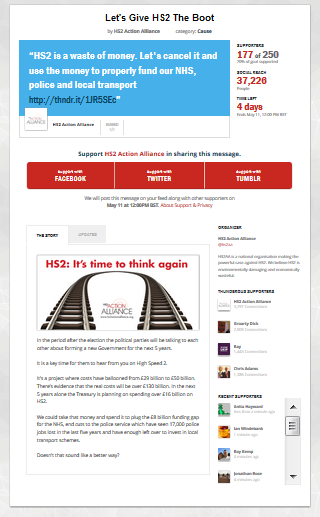 Today the anti Hs2 campaign finishes its electoral campaign not with a bang but a whimper. What’s been remarkable is how low key their campaign has been. Admittedly, both StopHs2 and Hs2aa are skint due to a shortage of donors & having blown all their money on futile court cases so a big poster or mainstream media campaign was out of the question. The only way they could try & make a fuss was on social media but even that’s been quiet. If it wasn’t for UKIP supporters desperately trying to keep the issue alive in the vain hope of grabbing some votes there’s be bugger all going on. Remember, there’s meant to be THREE main groups opposing Hs2. The presence of one (AGHAST) has been so off the radar it’s positively subterranean! Their Campaigns Manager, Deanne Dukhan (@DuKhanD)has tweeted a grand total of twice this month & only a handful of times during the entire campaign. No-one else from AGHAST has even bothered. Mind you, up to the start of the election their campaign website was STILL advertising a petition that closed in 2012 so it’s not really a surprise. Contrast this with the antis fantasy claims of a million people ‘blighted’ by Hs2, or that the majority of the UK opposes the project & you really do have to wonder what planet they’re living on. Whatever it is – it obviously doesn’t have access to Facebook, Twitter or the letters pages of UK newspapers! 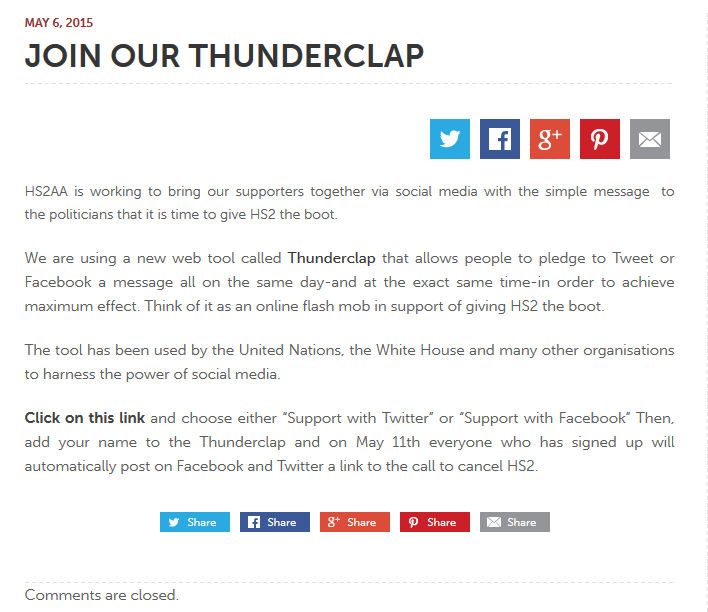 Their latest wheeze is a ‘thunderclap’. Here’s the explanation from their website. Here’s their results so far. Embarrassing, isn’t it? Remember this is a campaign that claims to represent the views of millions of people & that Hs2 is such an important issue it could seriously influence the result of the election. These ridiculous claims will be laid bare on Friday – and I’ll let you know how their ‘thunderclap’ goes as I doubt anyone will hear it otherwise! In the meantime, I’ll be staying up to watch the election results tonight. I’m looking forward to one or two ‘popcorn moments’ – especially the one from Thanet South. I’ll be taking time to Tweet & run this blog until tiredness or boredom sets in.